Wishing you a happy springtime filled with lots of greenery, sun, flowers, love, light, the ocean, great health, new beginnings, yoga, breathwork, meditation, and divine wisdom! You are, but what part of you? I was blessed to teach in my first Teachers Training Module with a team of my teachers! It has been an incredible experience, and I am so happy to be continuing on to the next module in two weeks! At the graduation celebration of the Naam RISE training last night, the students were asked what they gained from the wisdom and practices learned over the past five months. I reflected, on this as well, and recalled so clearly sitting in this very teacher training not too long ago. I realized that my life is completely different from then - that today I am living the life I have dreamed of for years! In one of the classes I taught this past weekend, I was talking about the Body of Pain. We all have one, as well as a Body of Light. Just like they sound, one triggers and then feeds off of your pain and suffering; the other, your joy, love, and bliss. I shared that when we are unconscious about our thoughts, words, emotions, behaviors, and actions our Body of Pain is creating our future. I recall being there in the past…and to be honest…I have been under the influence of my Body of Pain (BOP) for much of this new year. I am so grateful for this practice of yoga. The self inquiry and self-awareness that is cultivated by the breath work, the mantra meditations, the asana and movements are divine practices that help us wake up to our unconscious habitual patterns that not only run our daily lives today, but are creating our futures. I knew that message was meant for me, and I am sure I am not the only one who thought that! It was time for the breakthrough I have been feeling on the verge of (meaning I’d been in the midst of what felt like a breakdown!) It was time to activate my conscious willpower to stop a few unconscious patterns I have fallen into (excessive cell phone time wasting) and it was time to step into my Body of Light. After teaching my Vinyasa Plus class, I got on my mat for a Shakti Naam class at Naam LA taught by Courtney Miller. The whole class was gorgeous, she began by talking about being committed to our goals, staying present and consistent during the journey, while letting go of the attachment of the result. We moved, breathed, sweated, and laughed. During savasana she played a track by our teacher, Dr. Joseph Michael Levry, which is a prayer of Gratitude. I’ve listened to it many times, and each time it seems to open my heart a little more. For the final meditation she played another track by Dr. Levry called I AM. It is a beautiful and simple mantra. During the meditation I had three memories from childhood, and with each of them I clearly heard the words that my little girl self made those three situations mean, which I have unconsciously said to myself a gazillion times since then. I am letting go of that childhood voice of falsities. I am embracing my divine goodness and recommitting to my goals. I am creating my future with my Body of Light and I invite you to join me! It’s the universal time for a fresh start! Before you begin anew, you really need to clear out the old toxic stuff. Join me for a FREE two hour workshop on the beautiful Santa Monica beach! Soak in the healing rays of the Sun. Enjoy vegan, pure, safe, and beneficial light snacks and drinks. Network with a other health-minded lovelies. In this workshop I will show you practices that I do to raise my consciousness and reset my body, mind and spirit. These are powerful BREATHING practices to clear the mind, mantra MEDITATIONS to crack open your heart, MOVEMENTS to promote circulation and eliminate stagnation, and a NUTRITION system that has fully healed my digestive issues. I am committed to you feeling great and being your best self. Sharing this information with you makes me really excited. Invite a friend, so you can experience the same joy of giving as I feel, and meet me at Perry’s Cafe (at the parking lot of Hollister and Main)! Email me the names of your friends who are coming with you, and I will save you a space! Bring a yoga mat or towel/blanket. I am thrilled to be leading this beautiful course again…coming up very soon. Don’t miss out, I may not teach it again until late September. Imagine learning how to see yourself, your life, your habits and patterns from a completely different point of view, one that you may have never heard of or considered before. This body of work is transformative; offering techniques, universal laws, and spiritual keys for your enlightenment, health, wealth, and love relationships. Well have short learning and practice sessions with plenty of assimilation time during our long midday breaks. Relax and rejuvenate between sessions by filling your breaks with relaxing walks on the beach, Harmonyum Healing Treatments, Aromatherapy Massage, NAAMflexology sessions, or a nap before or after lunch! This six day course is perfectly scheduled so you can create a light filled urban retreat style immersion ~ that is truly all about you. 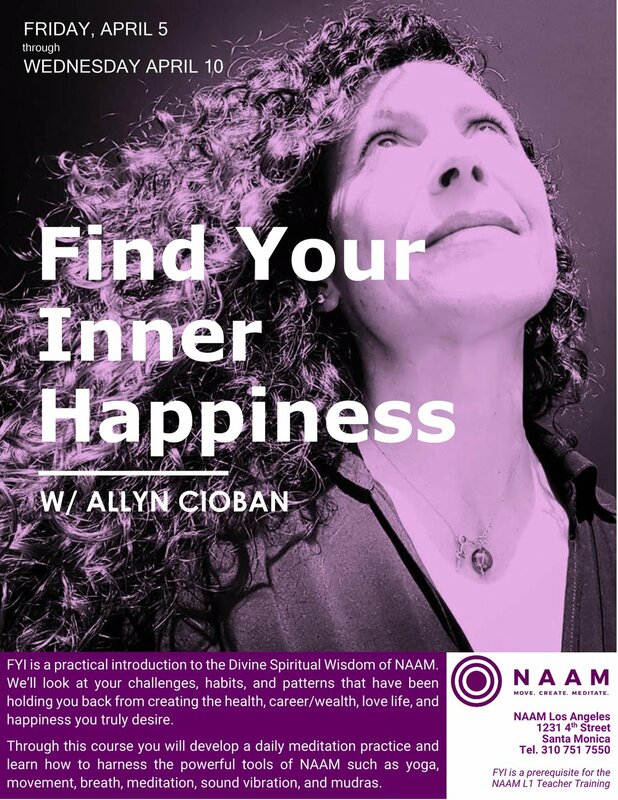 Read about this very cool course further on my website and on the NAAM website, where you can also REGISTER. We are powerful beings. We create with our thoughts. We create with our emotions. Many of us do so unconsciously, but it is happening. We are constantly reacting in our habitually patterned ways (first with thoughts, then with emotions, and eventually with actions). It might seem as though things are just happening to us, but it is not so – everything we are living is our creation. I worked at that company for seven years, and wanted to “just teach yoga” for the last few of them. I recalled that walk five days a week at lunch time, in my mind wishing I was not walking back to a job I didn’t want to do anymore. Then I remembered a “game” I started to play on that walk…I would pretend, act as if or visualize in my mind that I was a full time yoga teacher who was simply between classes/clients, enjoying a green juice and taking a leisurely stroll. It was fun and felt good to think like that, so I did it every time I could remember to! Today, between classes/clients, while enjoying a leisurely stroll, I realized that I had created this moment many years ago! It was perfect, just as I had visualized it would be and feel! Serendipitously, this is one of the lessons I’m teaching my students in the Your Essential Self 12-week yoga workshop this week. We are powerful. We create with our thoughts, with our emotions, with our imaginations. We have the power to get present, conscious, and to choose what we want to think and feel - and therefore create. Sign up with your email address to receive a free month on Yoga Vibes!